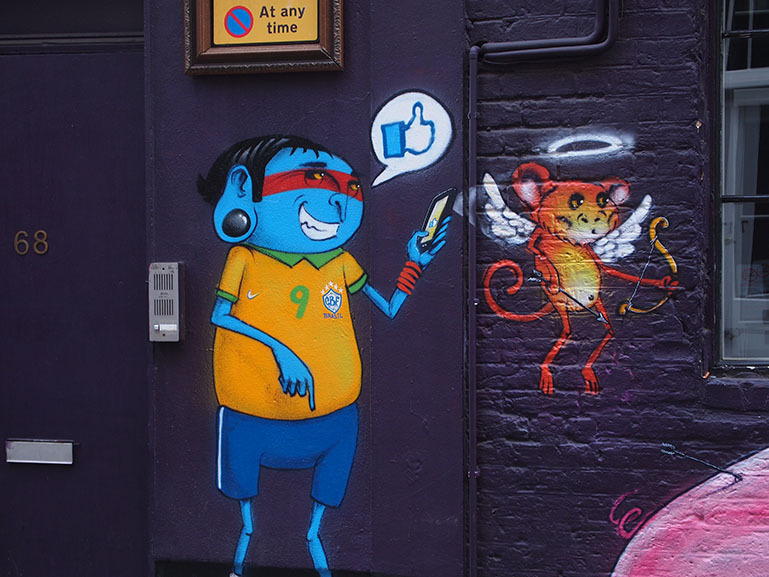 Are you familiar with the street artists whose works can be spotted on Shoreditch walls? Here is a selection of 25 of them. If you want to discover their new pieces and chat about their works, join our regular small group street art tours or order a private tour for you, your family or colleagues. We have added the link to the artists' websites or to the galleries representing them so that you can browse and enjoy their works. An Italian artist who has become a regular in the streets of London over the past years. His geometrical characters with thin necks and big vertical eyes are immediately recognizable. In July 2014, he had a solo show at the Saatchi Gallery. Another Italian artist based in Rome. She is an illustrator, set designer, and painter. Her beautiful portraits of women can be found in the streets of Sydney, New York, Barcelona, Oslo, Moscow, Paris, Copenhagen, Marrakech, Berlin, Saigon and London. A young Portuguese artist who studied in London. He is well known for his series of oversized portraits of ordinary people met in various cities carved directly into the walls. A recent London solo exhibition at Lazarides celebrated his gallery works. One of the most well-known street artists of the 21st century. His stencilled technique and dark clever humour contributed to his success. His first film, Exit Through the Gift Shop, was nominated for the Academy Award for Best Documentary. A British artist famous for its spray-painted giant letters on doors, walls and shutters around East London. His fame rose when David Cameron visited Obama in 2010 and gave him one of Ben Eine's painting. A few weeks later, we met him in the streets during one of our street art tours while he was busy refreshing one of the commissioned walls of the Shoreditch House. A crew of 4 artists from Haifa in Northern Israel formed in 2001. Obsessed with skulls and skeletons, their work can be seen in London’s East End, abandoned Mexican factories and museums such as the Tel Aviv Museum and the Haifa Museum of Art. Often described as “France’s answer to Banksy”. Based in Paris, he is considered as one of the finest stencil artists on the street art scene. His work often shows homeless people, street kids and bench lovers. 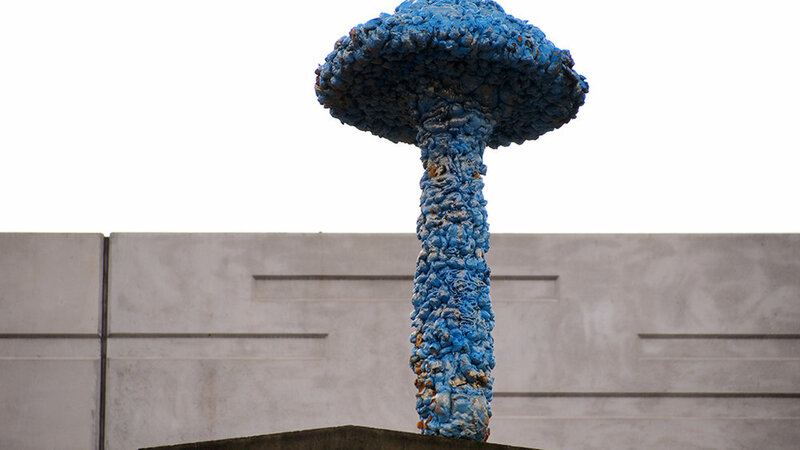 Based in London, his multicolour mushrooms can be found on the top of buildings all over East London, New York, Berlin and his native Cape Town. An Irish artist who currently works from his studio in East London. He blends realist figurative work inspired by old masters with abstractions taken from the graffiti scene. A Brazilian artist who grew up in Sao Paulo and started professionally in 1998. Well known for his little blue Indian characters put in various funny situations and often raising consumerism issues. A London based street artist and videographer. He says that he wanted to be a cartoonist. His colourful owls are his trademark. A Chinese born artist who lives and works in Cape Town. His distinctive murals often in black and white can be found all over the world. 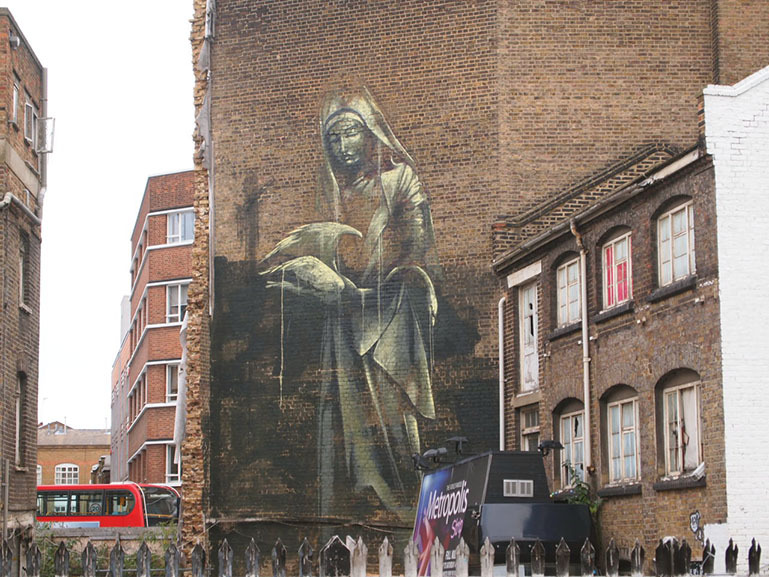 He is married to the street artist Faith47. One of the most famous and talented female street artist. Self-taught, she is based in Cape Town. She had in 2014 her first solo exhibition in London Aqua Regalia and the show is traveling this year to Rome and to the USA in 2016. Her delicate works perfectly fit into the urban environment. This British artist born in Leicester is well known for integrating dark humor into his art using everyday objects. His inspiration comes from his surroundings and the TV and he is often using slogans painted on street objects such as bins. A very well-known French artist whose work is influenced by the pixellation of 1970’s 8-bit video games. His colourful ceramic-tiles can be seen in various cities in the world. He uses cement to apply them on the walls looking for the perfect location. A Spanish artist well-known for his creation of miniature cement figures carefully placed in public places as part of his Cement Eclipses project. They can be found in all sorts of unusual places such as in gutters, on top of buildings or bus shelters. Cordal currently lives in London. An Australian-born artist who began painting on the streets at age 17. He has helped pioneer the stencil and street art movement in Brisbane. Anthony Lister uses a variety of mediums and his portraits are often characterized by the blue painting allied all around their eyes. An Italian street artist and painter. One of his famous murals painted at Cargo in Shoreditch entitled ‘Big fish eat small fish‘ was inspired from the works of Bruegel the Elder. An artist from Ghent, Belgium. Renowned for his giant black and white animal street art. He started off in the street art scene painting animals on abandoned buildings and warehouses in the isolated industrial areas of his hometown. A street artist from Melbourne, Australia. He is well known for his image of women's faces created with the use of stencils. An American contemporary artist and graphic designer. He emerged from the skateboarding scene, became widely known during the 2008 U.S. presidential election for his Barack Obama "Hope" poster. A British artist based in London. His characters full of simplicity and poetry are cleverly blending into their urban environment. An American street artist who specialises in life-size wheatpaste prints and paper cutouts of human figures. A French artist who claims to be the first person to paint the Berlin Wall. His trademark motifs are groups of colorful heads in profile outlined by black lines and showing heavy lips. For our tailored street art tours, follow this link.